Combine the flour and water in a large mixing bowl. Work into a smooth dough. Set aside. Halve the white tops of half of the scallions lengthwise, then roughly chop them; finely chop remaining scallions. Julienne the onion. In a small saucepan over medium heat, heat enough oil to cover the roughly chopped scallions and onion, and continue to fry them for approx. 10 min. until golden brown. Remove from heat and set aside. Divide dough in half and flour a work surface. 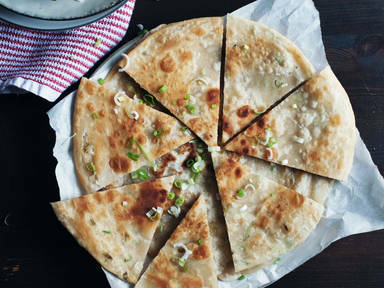 Roll each piece of dough into a long, thin strip and coat with a small spoonful of scallion-infused oil, five spice powder, and salt. Sprinkle remaining chopped scallions on top, reserving some for garnishing. Tightly roll the dough into a ball from one of the short ends; press down with the palm of your hand. Cover with plastic wrap and let rest for approx. 10 – 15 min. Remove plastic wrap and roll into a large, flat pancake, approx. size of the frying pan. Heat some of the remaining scallion-infused oil in a large frying pan over medium-high heat. Add the pancake and cook for 2 – 3 min. per side until golden brown. Transfer to a paper towel-lined plate to drain. Cut into wedges for serving and garnish with remaining chopped scallions. Enjoy!